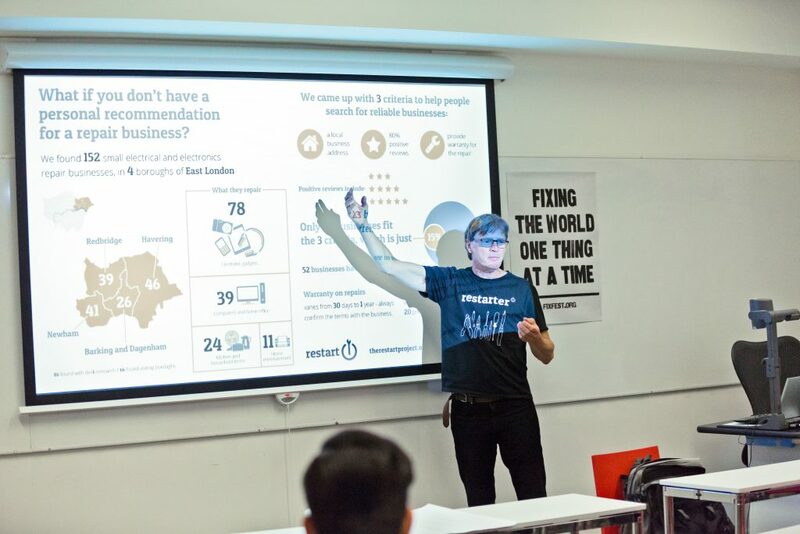 At Fixfest, we discussed how to move towards a world in which repair is embedded firmly in society: in schools, in the commercial sector, and promoted by local government. Beyond continued sharing of experiences and information, there is great potential for further collaboration here. For repair to thrive, you need trained repairers. Alongside making sure that community events emphasise the value of learning repair skills, we discussed ways in which repair can be embedded in formal education, mostly focusing on primary and secondary schools. Janet shared her work with a secondary school in London, in which the technical side of repair is taught alongside the context of its social and environmental benefit. Others shared experiences from New York, Montreal and Hamburg. This raised some questions concerning how repair groups can respond to the needs of schools and other educational institutions. Notes are available here. Partnerships with local governments can provide repair groups with funding, space and outreach opportunities. It is also an essential step in understanding how community repair can be integrated with local resource management as we move towards circular economies. Stephan gave a lightning talk on how repair groups are working with local government in Barcelona, which was discussed further on Sunday when we discussed best practices with repair activists from around the world. Community repair and commercial repair are not in competition: they should be in cooperation, to ensure repair always remains an option. In an unconference session, James (Hackney Fixers), Marina and Meli (Club de Reparadores) covered their parallel efforts in East London and Buenos Aires to map/link with existing repair businesses (notes) (slides). On Sunday, we identified the need more broadly for the community repair movement to communicate with repair professionals.